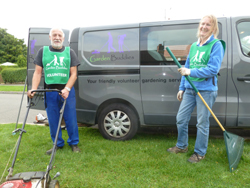 Garden Buddies is a lottery funded project where volunteers provide practical help to elderly and disabled people, who have no other means of support, enabling them to maintain and enjoy their gardens. This community project aims to offer support to the most needy while also providing a positive focus for volunteers of all abilities. The idea came about as a result of a large number of gardening-related enquiries we received at the volunteer centre, highlighting the need for a service like this in South Northamptonshire. Following a successful bid to the Big Lottery Fund, Garden Buddies burst into bloom in May 2012. In order to benefit from the Garden Buddies service householders need to join the scheme as a member. Full details of how to become a member. Could you be a Garden Buddy? Would you like to join a friendly team of volunteers helping elderly or disabled people in your community? to add to your CV or just being part of a team. Our Garden Buddies project worker will be on hand to supervise every session. The time you give can be flexible and volunteers can opt for lighter duties, if preferred. All tools, equipment and training will be provided.